Being a dog owner has high highs and low lows. When you first get your puppy, you laugh and marvel at the wonder, curiosity, and excitement in their eyes. You bask in their energy and cuteness. Sometimes, you scream when overlooking puppy devastation but it’s not long before you forgive. Then, they gets a bit older and you go on adventures together. You build experiences and memories together. They do everything with you. They are your partner. They ares your best friend. Your bond and friendship grows and grows. But then, there’s the hard part. Dogs ages a lot faster than humans. Just as fast as they grow from puppy to teenager to adult, they’ll be going to a wise old dog. And they’ll still want to have those adventures and create those memories with you. But they won’t be able to like they used to. As dog gets older, they have less mobility. It’s hard for them to get up, walk, and do all the normal things they loves to do. This is part of the natural aging process but it’s unfortunate that you have to watch, feeling helpless as it happens all too quickly. But, you don’t have to just watch, feeling helpless. There is something you can do. You can give your dog a natural supplement: DGP. It was developed by scientists and herbalists in a joint effort to help with the mobility of your dog’s joints. 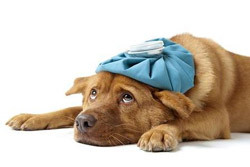 Your older dog will have aches just from walking outside and walking to the food dish. DGP can ease that discomfort and can do so in as quickly as one week. And, it also doesn’t have any side effects because it’s natural. You can watch your wise old dog get some mobility back and do some of the things that made them happy but they lacked the mobility to do. And it will all be because of a natural supplement that eased their discomfort and helped with mobility. You don’t have to stand on the sidelines anymore. All you have to do is give your dog anywhere from ½ tablet to 4 tablets per day, depending on their size. Add it to their favorite food or a treat and they’ll take it right down – unless you have one of those “too smart for their own good” pups that always knows when something’s up with their food. But even then – once you give them their DGP and start to see how they start moving, you’ll be happy you did. Try it today. Give it at least a week and see what happens. Most dog owners are not disappointed with the improved mobility of their dog. In fact, most are overjoyed and have big smiles. So you’ll be helping yourself too.